« Persistent Question: What is the ‘right’ way to eat sushi? 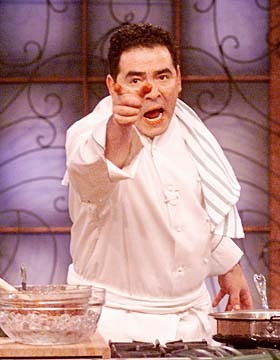 This entry was posted on November 27, 2007 at 4:43 am and is filed under News with tags Emeril, News. You can follow any responses to this entry through the RSS 2.0 feed. You can leave a response, or trackback from your own site. oh well…leaves me more time for other stuff. rachael ray? …now that’s a winner! I want to see Alton Brown slow steam a Chilean sea bass in garlic and pork fat in a contraption he made from a flower pot, a turkey baster, and a weather vane.